Four new talents for your dog. First two of them are passive, others are activated. 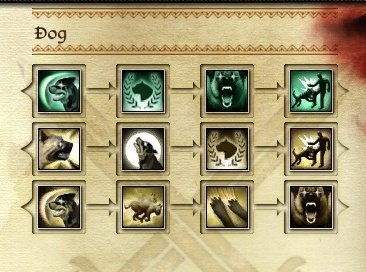 In addition, dog gets a talent every 2nd instead of every 3rd level (this will work only for levels your dog will gain after this addin was installed). This is my first addon for Dragon Age, so forgive me if something's not working, I'm still learning as I go. The mabari has undergone a training of endurance and survival, gaining a bonus to stamina. The mabari has formed a special bond with its master, gaining a bonus to mental resistance. Mabari lets out a frightening howl, forcing nearby enemies to cower in fear unless they pass a mental resistance check. Mabari will jump on its target and bite its neck. If the target is a living creature, it will die instantly if of normal or lesser rank unless it passes a physical resistance check. Lieutenant-ranked enemies will suffer a critical hit, while boss-ranked enemies will take only standard damage. Additionally, all targets who can bleed will take additional damage over time. Non-bleeding creatures will only take normal damage.